With new boundary changes coming into effect before the 2019 provincial election, current Cardston-Taber-Warner MLA Grant Hunter has announced his intention to seek the UCP nomination for the region’s new electoral division, Taber-Warner. 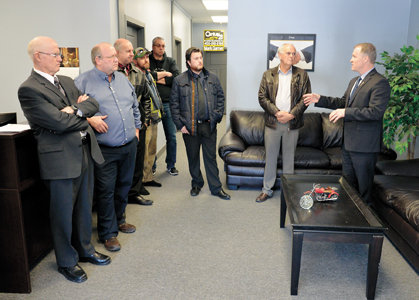 Speaking before a small crowd of supporters on Monday afternoon inside a realtor’s office on 48th Avenue, Hunter detailed some of the difficulties that surrounded the decision, including initially parachuting himself into a new riding that he doesn’t currently reside in. The new Taber-Warner riding encompasses portions of the current riding but also includes Coaldale, Milk River, Bow Island, Foremost and hamlets right to the County of Forty Mile’s eastern border. The Old Man and South Saskatchewan Rivers form the northern boundary. Cardston-Siksika forms a tall, hourglass-shaped riding stretching north and south of the city of Lethbridge. Its boundaries extend all the way from the U.S. border to a section of the Trans-Canada Highway. Now approved in the legislature, Cardston and Magrath will now share an MLA with Coalhurst, Picture Butte and Vauxhall along with communities in Vulcan County and the Siksika First Nation. Hunter, who has represented Cardston-Taber-Warner since May 2015, expressed admiration for the economic drive and entrepreneurial spirit that have made Taber a success in the past. Just back from a trip to southeast Asia, Hunter compared the devastating 2004 tsunami to the election of the NDP in Alberta in 2015. Viewing the NDP’s majority victory as a backlash against decades of PC mismanagement, Hunter disputed this characterization, suggesting many of the previous conservative government’s policies were fundamentally sound. While there is currently no UCP constituency organization in place for Taber-Warner, Hunter expects these details to be worked out over the course of 2018. Although not right away, Hunter confirmed that he plans to relocate to Taber-Warner once his children have finished high school. Stepping back into politics in an insider role, former mayor Henk DeVlieger announced he would be taking on the position of Hunter’s campaign manager in the upcoming nomination race. DeVlieger praised Hunter’s efforts on behalf of the town which he witnessed during his term in office as the community’s top elected official.